Account for approximately 40 to 45 percent of the blood. Biconcave disc which is round and flat, sort of like a shallow bowl. Disk diameter of approximately 6.2-8.2 µm. They have a thick rim and a thin sunken center. Can change shape without breaking. Production of RBCs is controlled by erythropoietin. 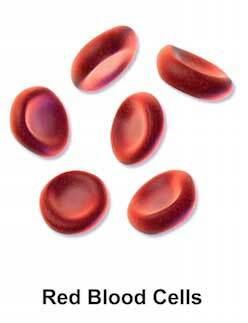 The iron found in hemoglobin gives the blood its red color. Life span of 120 days. 4 million new erythrocytes are produced per second in human adults. 20–30 trillion red blood cells at any given time. Transport oxygen from the lungs to the cells of the body. Pick up carbon dioxide from other tissues and unload it in the lungs. Account for only about 1% of the blood. They are the cells that make up the majority of the immune system. It is the part of the body that protects itself against foreign substances and various types of infections. They are made in the bone marrow from multi-potent cells called hematopoietic stem cells. They exist in all parts of the body, including the connective tissue, lymph system, and the bloodstream. Leukopenia is a low white blood cell count that can be caused by damage to the bone marrow from things like medications, radiation, or chemotherapy. 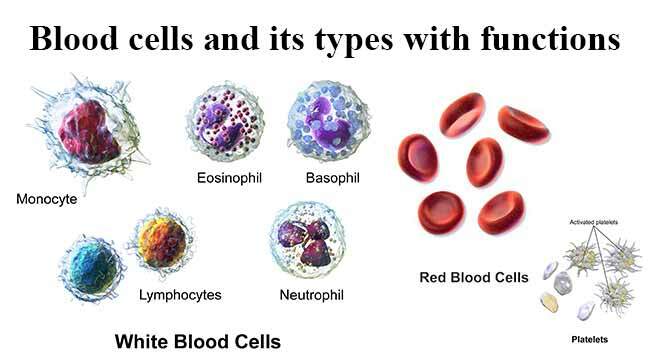 Leukocytosis is a high white blood cell count that can be caused by a number of conditions, including various types of infections, inflammatory disease in the body. They are divided into Granulocytes (having visible granules or grains inside the cells) and Agranulocytes (free of visible grains under the microscope). There are five main types of WBCs. : Neutrophils (granulocytes), Eosinophils (granulocytes), Basophils (granulocytes), Lymphocytes (non-granulocytes) and Monocytes (non-granulocytes). Most common type of white blood cell. Contain very fine cytoplasmic granules. Also called polymorphonuclear (PMN) because they have a variety of nuclear shapes. Life span of 6 hours to few days. Kills bacteria through the process of phagocytosis. They also release a burst of super oxides that have the ability to kill many bacteria at the same time. Kills parasites and have a role in allergic reactions. Releases toxins from their granules to kill pathogens. They have a pale nucleus that is usually hidden by granules. Bi-lobed or Tri-lobed nucleus present. Life span of few hours to few days. Secrete anticoagulants and antibodies that have function against hypersensitivity reactions in the bloodstream. Basophils contain histamine, which dilates the vessels to bring more immune cells to the area of injury. Secrete heparin which is an anticoagulant that promotes mobility of other WBCs by preventing clotting. Life span of years for memory cells and weeks for all else. T lymphocytes (T cells) are responsible for cell-mediated immunity. B lymphocytes are responsible for humoral immunity or antibody production. They can recognize and have a memory of invading bacteria and viruses. Function in destroying cancer cells. They present antigens to activate other cells of the immune system. Turn into macrophages when they exit the bloodstream. Enters the tissue, where they become larger and turn into macrophages. Destroy old, damaged and dead cells in the body. Small fragments of bone marrow cells. 150,000–400,000 platelets in each microliter of human blood. 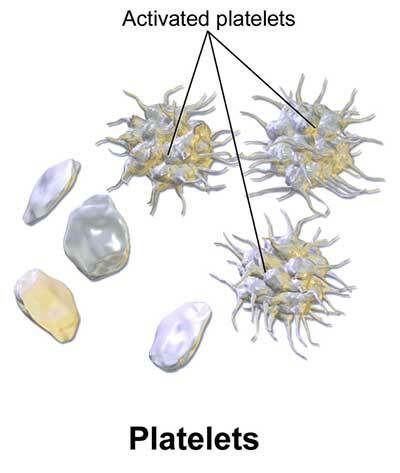 Platelets are the parts of cells that the body uses for clotting. Helps to promote other blood clotting mechanisms. Example: Secrete procoagulants (clotting factors) to promote blood clotting. They secrete vasoconstrictors which constrict blood vessels, causing vascular spasms in broken blood vessels. They secrete chemicals that attract neutrophils and monocytes to sites of inflammation. Dissolve blood clots when they are no longer needed. They secrete growth factors to maintain the linings of blood vessels. is there not also the types, structure, function, and origin of the list of the component of blood the origin of one cell per mm cubic.